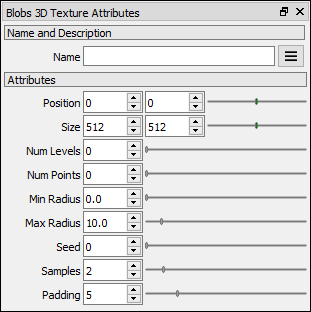 The Mesh Blobs 3D Texture node generates a 3D texture from a random set of metaball spheres of random radiuses that generate smooth blobs. Load a Model into the Scene. Drag the Mesh Curvature icon into the Node Graph. An image with the baked 3D Blobs Texture. Position X Position X of the output image. Position Y Position Y of the output image. Size X Size X of the output image. Size Y Size Y of the output image. Num Levels Number of levels of shading. A value of gives a continuous smooth shading. Num Points Number of points used as blob seeds. Min Radius Minimum radius of the metaball spheres. Max Radius Maximum radius of the metaball spheres. Samples Number of samples per pixel. Padding Defines the size of the ring of pixels around the rendered zones, which prevents filtering issues when the model and textures are 3D rendered.